Mönchengladbach - Borussia Mönchengladbach's quest for European football is really starting to gather pace. Their 2-1 victory over FC Schalke 04 lifted Lucien Favre's team level on points with Borussia Dortmund and put clear daylight between themselves and the Royal Blues in fifth. 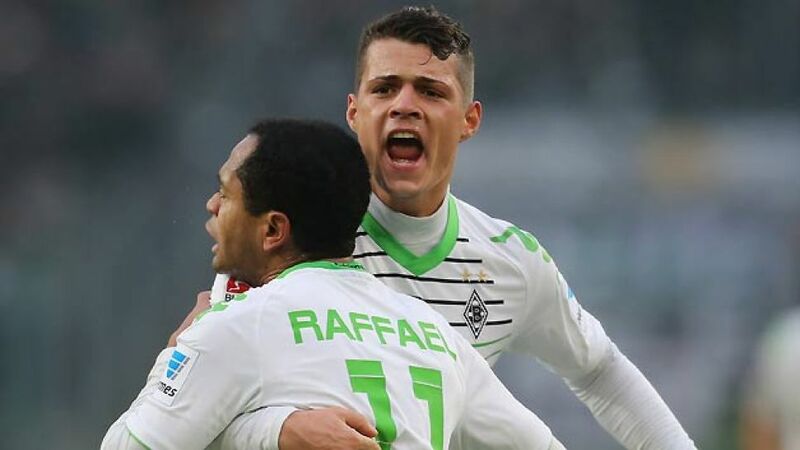 Following Gladbach’s eighth straight home victory, bundesliga.com spoke exclusively to Swiss international midfielder Granit Xhaka about the Foals’ excellent form, their ambition for that all-important final Champions League place and his own personal excitement for the 2014 FIFA World Cup. bundesliga.com: Granit Xhaka, Borussia’s 2-1 win over Schalke was your eighth straight home victory and the sixth consecutive win in the league. What was your opinion of the game? Granit Xhaka: It was a six-pointer at home that we were desperate to win and we managed to do that. We were good in the first half. The second half was a bit more difficult, even though Schalke only had ten men. Overall, it was a deserved victory. Xhaka: Exactly. We also trailed 1-0 against Nürnberg and came back to win 3-1. We had a little bit of luck with the penalty and the red card against Schalke, but you can see we’re in good form and long may it continue. bundesliga.com: What made the difference against Schalke? Xhaka: It was important that we scored the second goal before half-time and that we didn’t start hoofing balls forward after Schalke’s goal. We were very disciplined, both offensively and defensively. That was the difference. bundesliga.com: Gladbach have extended their lead over Schalke to seven points, while the gap between yourselves and seventh place is even greater. Your aim of securing European football is looking promising indeed. How do you rate your chances? Xhaka: I think we’re heading in the right direction, but we’ve only played 15 games so far. We’re taking one game at a time and we’re trying to play to our full potential in every game. The second half of the season is still to come, but we’re doing very well so far. bundesliga.com: When the season resumes in January, you with home matches against FC Bayern München and Bayer 04 Leverkusen. You’ve already beaten Champions League opposition in Borussia Dortmund and Schalke, which suggests you have the potential to get something from those games. Would you agree? Xhaka: We’re not looking that far ahead. We’ve still got to play Mainz away and Wolfsburg at home and we want to get maximum points from those games, but it’ll be difficult. First of all, we have to make sure we play well against Mainz. bundesliga.com: What do you think of Mainz so far this season? Xhaka: We watched their game at Nürnberg on Friday. They’re a good team and it’s going to be difficult, as it was last season. We’re going to prepare well this week and listen to our coach’s advice. Then we’ll see what happens. bundesliga.com: Finally, Switzerland have been drawn against Ecuador, France and Honduras in the 2014 World Cup group stage. What do you make of the group? Xhaka: Anything is possible in the group. France are the favourites, but we mustn’t underestimate Ecuador and Honduras. We’re desperate to qualify for the last 16. We proved we’re more than a match for the bigger nations during qualification and in a couple of friendlies. I’m really looking forward to my first World Cup, but there’s a long way to go before then.